Developing and implementing Quality Management System (QMS) for Frontwave Ltd (FWL) is like a dream come true especially in this era when quality of goods and services in Pharmaceutical and Allied industries has become uppermost in the mind of customers. FWL like other smart companies has indentified this trend and has decided to adopt NIS ISO 9001:2008 Quality standard with a view to providing top quality goods and services to all their stake holders. 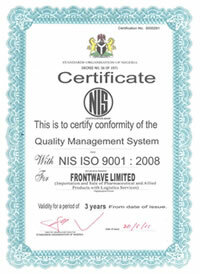 In May 2011, FWL’s QMS was adjudged by the Standard Organization of Nigeria (SON) to conform to the Requirements of NIS ISO 9001:2008 standard and is consequently certified.